After more than a century of being largely ignored in print, Scottish Rite Freemasons in the Northern Masonic Jurisdiction of the U.S. can finally rejoice. 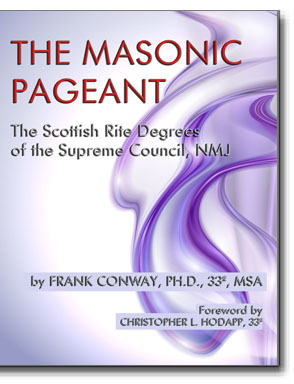 After well over a year of a twisting path to publication, it has officially been announced that The Masonic Pageant: The Scottish Rite Degrees of the Supreme Council, NMJ by Illus. Frank Conway, 33° is finally being released in late summer 2017. It is being offered by Cornerstone Publishing and can be pre-ordered directly from the publisher HERE. The Masonic Pageant is a clearly written and easy to understand explanation of the Scottish Rite Degrees as worked by the Supreme Council 33º, Northern Masonic Jurisdiction. Frank Conway, Ph.D., 33º, MSA provides a long needed and extremely valuable resource to all Scottish Rite Masons of the NMJ. This is a must have book for all NMJ SR Masons and bodies of the NMJ. The last serious attempt to publish a guidebook to the NMJ degrees was the continuously revised Book of the Ancient Accepted Scottish Rite by Charles T. McClenachan last released in in 1907. Ever since then, NMJ members have been left in the dark regarding the background, symbolism, history, and any other information about the degrees that make up their own distinctive system of rituals that differ almost completely from their Southern Jurisdiction counterparts (and the rest of the world's). Illus. Brother Conway has at last addressed this gaping lack of access to knowledge and performed an incalculable service to the more than 200,000 members of the NMJ who have been starved for information for so long. The book is 320 pages long and the list price is $26.95, plus shipping. Yes, it is worth the investment. Just coincidentally, take note that the NMJ has just announced they are publishing a new book that should be of great interest to ALL Scottish Rite Masons. The Supreme Council, 33°, Northern Masonic Jurisdiction, proudly announces the publication of the first officially sanctioned edition of The 1783 Francken Manuscript. This 720-page book includes a complete full-color photo facsimile of the Manuscript with footnoted transcriptions on facing pages. With introductory essays by Alan E. Foulds, Aimee E. Newell, and Jeffrey Croteau. The 1783 Francken Manuscript contains degree rituals of the Rite of Perfection (Order of the Royal Secret), from the 4th degree to the 25th. It is the most complete collection of the earliest surviving English-language versions of many Scottish Rite degrees. This book will be indispensable to anyone interested in the history of Masonic ritual and the roots of Scottish Rite Freemasonry. The book will be made available through the Supreme Council NMJ on June 1st, 2017 for $95, which includes free domestic shipping. 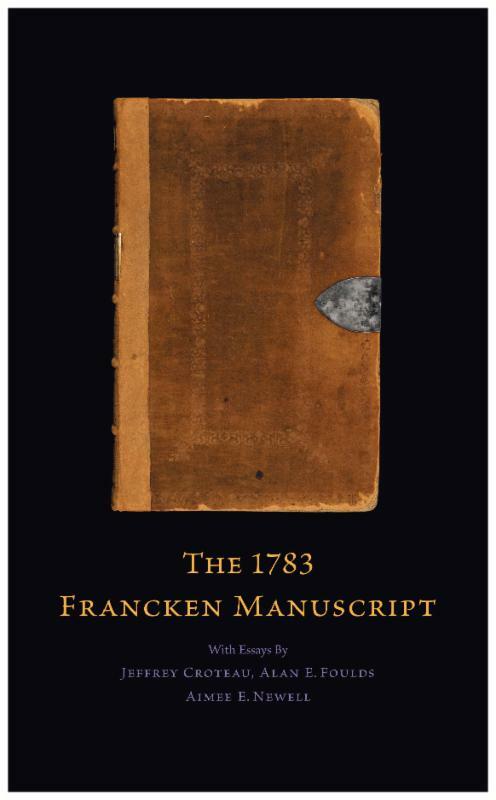 The Francken Manuscript is NOW AVAILABLE from the AASR-NMJ online HERE. This is great news and I have just reserved my copy of 'The Masonic Pageant'. Hopefully,this book will will help our good Brethren to more fully appreciate Masonic diversity and experience a "more perfect union". Tom, 32* life member SJ, USA. SRRS, life member. Mike won't let me buy one. I pay for my vices, dammit. I only just went through the SMJ Scottish Rite degrees about a month ago. Read Bridge to Light and have started on Morals & Dogma (which will take a while). And I have to say, I'm looking forward to owning a copy of these. I don't live close to any NMJ Valleys so I don't know when/if I'd ever get to see the degrees, but I'd love to know how the NMJ does them.